Need Help with your Casting?? on the First (1st) Saturday of every month. We are now having an “Introduction to Fly Fishing” class, taught by Earl Arnold, for those new to fly fishing (or anyone else), so please talk it up and come join with your friends and enjoy practicing and improving your skills. If you are having a casting problem or want to learn a particular cast, we can help. NOTE: If it’s raining, we will reschedule. In addition to casting lessons, Ann Bull will give a short talk about fly fishing gear for those new to fly fishing (or anyone else), This month we will also include a "Ladies Only"class so please talk it up, come and be with your friends, enjoy practicing and improving your skills. If you have any questions about fly fishing, have a casting problem, or how to do a particular cast we can help. 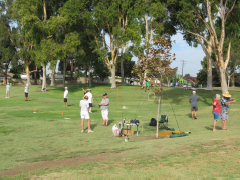 Chumash Park, 750 S. Petit (at Waco) in East Ventura (off Telephone Road) from 9:00 to 11:00 AM. If you have any questions contact our current Casting Director, Bob Smith (805) 647-3522. Bob is available to anyone who would like some help with their casting. BOB SMITH is our Casting Director and is an FFI Certified Fly Casting Instructor. April 6, May 4, June 1, July 6, Aug 3, Sept 7, Oct 5, Nov 2 & Dec 7. The turnout from our members, and from the community, has been great. Your help in teaching those from the community is really appreciated. I’ve always felt that when you help others it helps you. The good news is since there has been such a good response we are going to continue our Saturday clinics on the first Saturday of every month until further notice. I would really appreciate your comments and suggestions as to how we can make our casting program better, and ways to reach those in our community who might have an interest in fly fishing (the local Star no longer has a Community Events section). Again, thank you for your support, and we’ll see you on the first Saturday of the month. So write CASTING on your calendar for the first Saturday of the month! Have you ever thought about becoming an FFI Certified Casting Instructor? If you have ever thought about becoming an FFI Certified Casting Instructor (CCI) and possibly working toward that goal, please let me know. Just working toward becoming a CCI could really improve your casting skills.